Building a single customer view is essential. Here’s why and how. Marketers are well aware of the reality of customer relations in 2019. They are fragmented and non-linear, and we are endeavoring to map them out in order to better understand the consumer and how they interact with brands. To further increase the complexity, it appears that many are expecting to see a drop in brand loyalty in the coming years. Faced with these challenges, we now need to know how to orchestrate campaigns across multiple channels at once, without losing coherence. This omnichannel mentality ensures that the right interaction will always be served up at the right time. Easier said than done, you may say. True enough, but at the same time, it’s getting less and less difficult. One potential consequence of the drop in loyalty (whether real or overrated) is that organizations would be more dependent on media buys to continue to acquire new customers. To avoid overexposing themselves to this risk, organizations need to get better at using the data they possess to create a better customer experience. The best way to use customer data is to centralize it. When you centralize your customer data, it becomes a lot easier to understand who your customers are, and act on this improved understanding. This idea of centralization is often referred to as the Single Customer View. It’s neither a technology or a product, but rather a way of seeing things. Media interaction data is particularly rich and allows you to build a lot of context around your customer data. How can we create a single view of the consumer, in concrete terms? There are several ways, ranging from the very simple to the very complex, to create a single customer view. I am going to take a deeper look at three approaches that cover a wide range of use cases, because in many instances they can be deployed in the service of either small or large organizations. 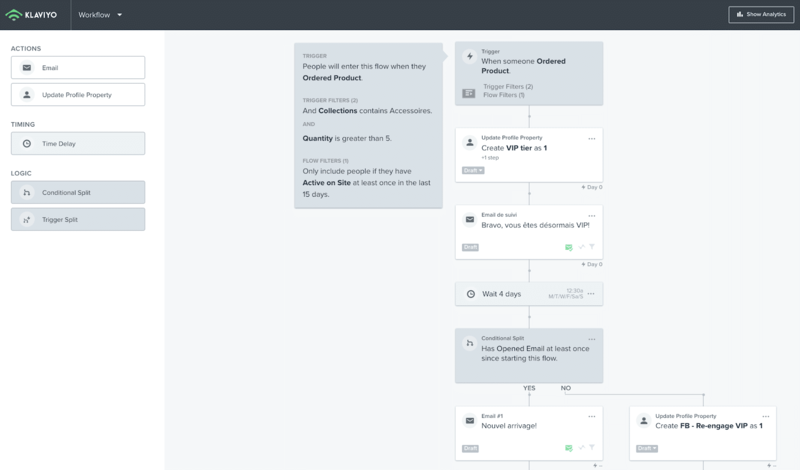 When you take a look around, you’ll realize that there now exist several marketing automation tools that offer native multichannel integration. More specifically, tools like Active Campaign and Klaviyo allow you to engage in site tracking by adding a snippet of code on your site. Concretely, site tracking will allow you to centralize your site’s navigation data and pair it with email data. By doing this, you’ll end up with far more powerful segmentation, which will allow you to increase the relevancy of your customer interactions. A common use case is the creation of a segment based on a website interaction. Here’s an example from Active Campaign where we create a segment that can then be used for automated emails, to create a media audience, etc. In addition to navigation data, your e-commerce data can also be centralized in a few clicks. At least that’s what Active Campaign and Klaviyo offer to do, as long as you’re using a supported CMS. In the case of Klaviyo, it only takes a couple of minutes to get your transactional, navigation and email data centralized in the tool. Shopify integration is turnkey, and the synchronization of 5,000 contacts and 15,000 transactions took us about an hour, compared to a bit more than three hours in Active Campaign. A pretty impressive integration! This type of tool is particularly powerful when it comes to advanced automations that take consumer context into consideration. 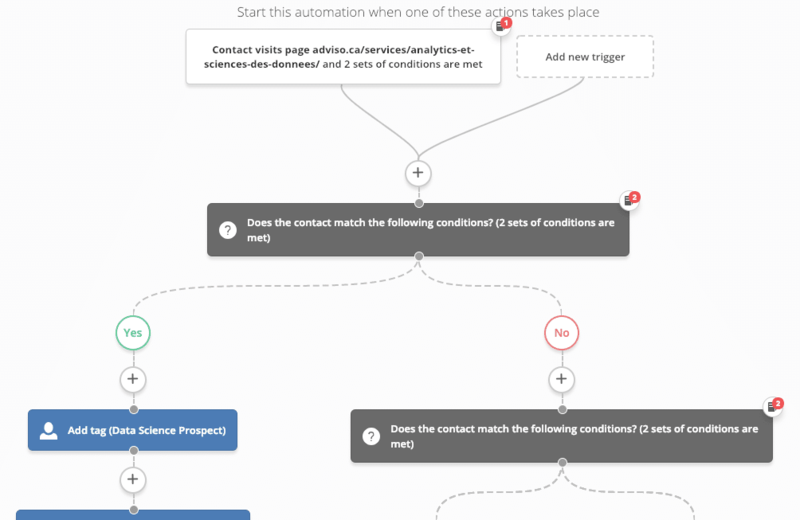 As an example, let’s look at an automation trigger based on a purchase or purchase pattern. The image below demonstrates an e-commerce trigger for accessory purchasers who recently visited the website. Once the criteria are met, the user is identified as a tier = 1 VIP (arbitrary rule, you can make it anything you want). The user is then sent an initial email. If they open it, a follow-up is sent with recommended products. If they don’t open it, they are added to a Facebook audience specific to VIP clients. The advantage of this type of tool is that it has everything you need to bring your omnichannel vision to life right under one roof. By combining the layers of information gathering, centralization, unification and activation, a solid argument can be made in favour of these tools. A major inconvenience of this approach is that it still isn’t easy to access the raw data. The potential value is therefore automatically limited. Even though APIs have been developed, the data is still generally altered and incomplete. So even if your Shopify data appears in Klaviyo, you can’t use Klaviyo to access your raw Shopify data. To do that, you would have to consider using a data warehouse. 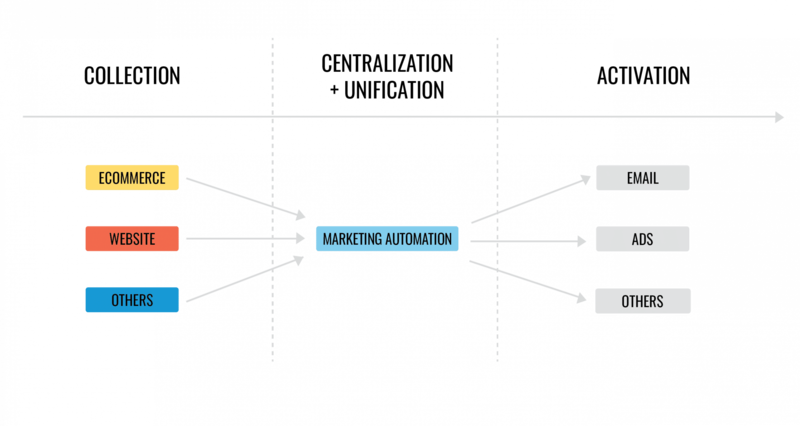 In summary, here’s a high-level diagram of what it would look like if you used a marketing automation platform. If you approach the single customer view with the belief that data is an important asset for your organization, you’ll quickly realize that data warehousing is essential. Simply put, the approach consists of centralizing raw data in a single location. The goal is to separate the content from the container by extracting the data from any marketing tool you use. For example, the data in Google Analytics is super interesting when you look at it within the platform. However, once you’ve extracted that data, it becomes possible to use it for statistical modeling to answer questions that Google Analytics itself couldn’t answer. 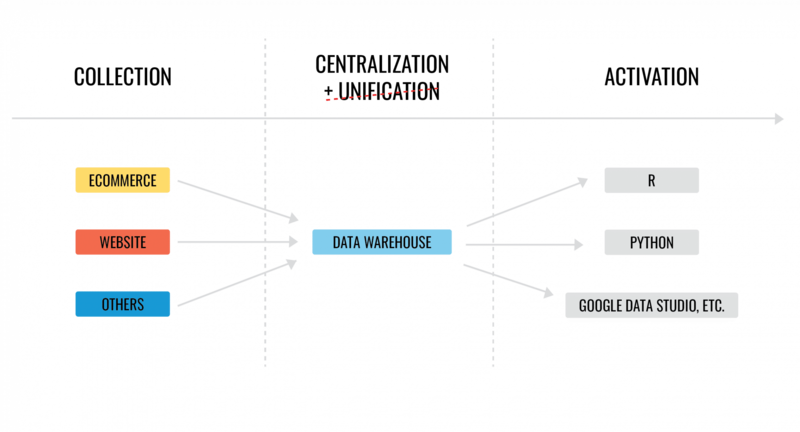 The idea of creating a data warehouse is absolutely nothing new, but the democratization of this task, which traditionally relied heavily on IT, is fairly new. A tool that, for me, makes the argument for the creation of a marketing data warehouse is Stitch. This SaaS tool allows you to select your data sources and send your data to a data warehouse in just a few clicks. It’s truly impressive. 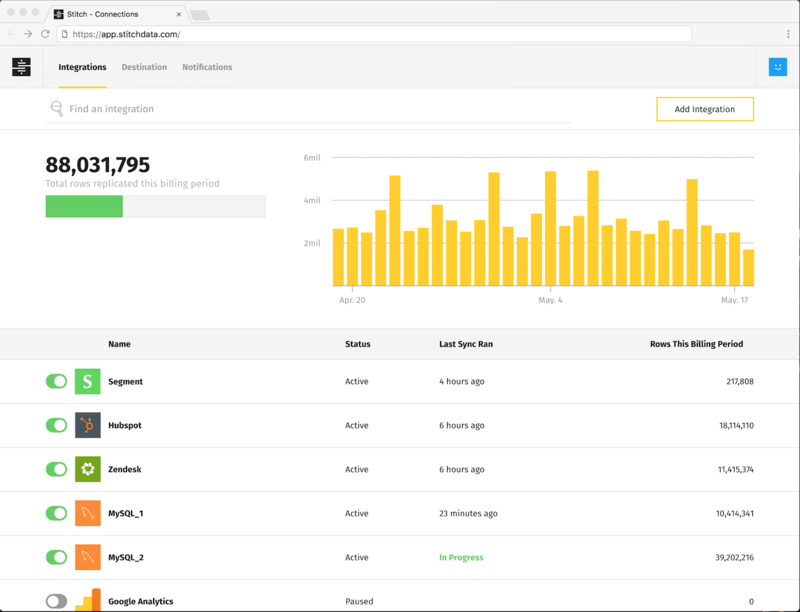 By using the Stitch web interface, you only need to connect to the tools to allow the platform to handle data centralization. Once the decision is made, simply tell Stitch where to send the raw data and you’re done! The big advantage of data warehousing is that the data truly belongs to you. 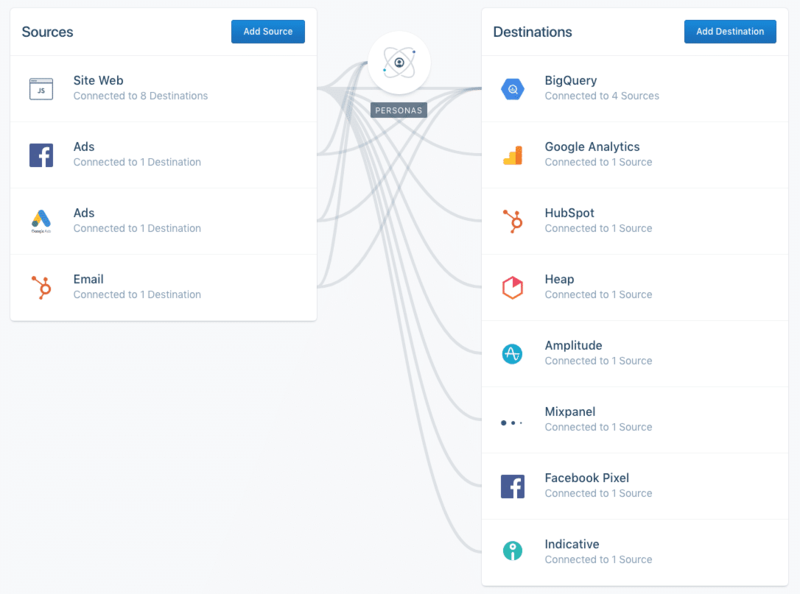 If ever you wanted to stop using a particular service (migration from Klaviyo to Hubspot for example), your data would stay on your servers, intact. Still, two important aspects are generally not included with data warehouses, namely the unification and activation layers. In other words, once you’ve centralized your data in a warehouse, you would need a data scientist to unify all the different data sources (easier said than done) and to activate the data as a media audience, for example. In summary, here’s a high-level diagram of what it would look like if you used a marketing data warehouse. So far, the two centralization options we’ve looked at both involve significant compromise. So, how can you have your cake and eat it too? In other words, how can you have access to your raw data, an important asset for any modern organization, while still being able to easily use it to take concrete actions? That’s where a CDP comes in. Centralization: A CDPs capacity for centralization surpasses the previous options because it is both capable of creating a data warehouse and governing your audiences. Essentially, the CDP allows you to manage omnichannel audiences to then redistribute them to the right channels (email, Facebook Ads, a DSP, etc. ), while maintaining the synchronization of these audiences. Unification: Centralizing data is not enough, you also need to unify the data. If a user visits both your website and your mobile app, it’s important to know that those visits were by one individual, not several. A CDP takes care of this complex task for you. Activation: Unlike a data warehouse, it’s easy for a marketer to use a CDP for actions like sending a media audience to your tool of choice, or even segmenting your A/B tests based on these same audiences. 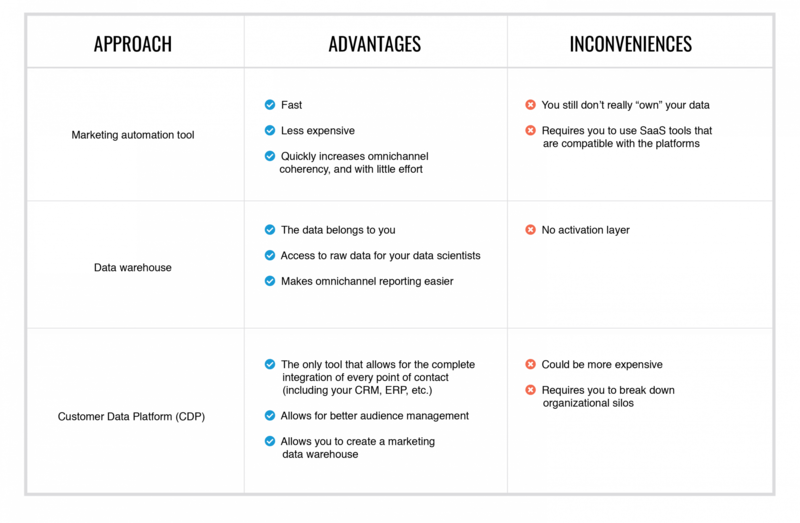 The CDP seems like the most robust option for getting a complete customer view. In addition, these tools were created with marketers in mind, to enable them to be more independent and accelerate the execution of marketing tasks. 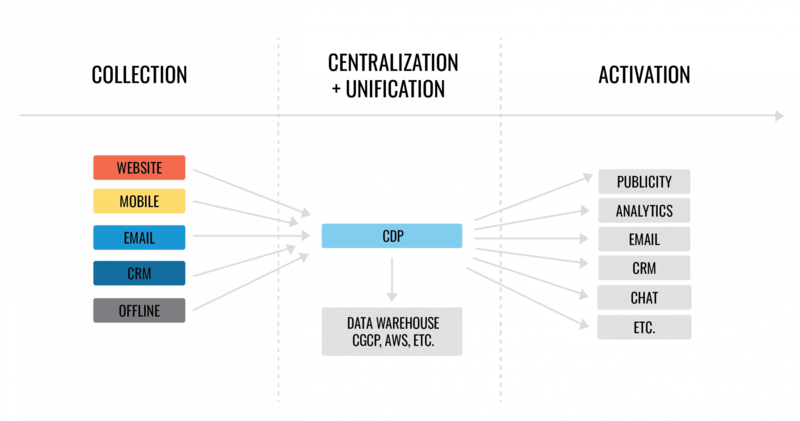 Finally, your CDP is where all the GDPR-related data lives. This allows you to respect the consumer’s right to not be tracked, and simplifies the implementation of this across all your marketing channels. In summary, here’s a high-level diagram of what it would look like if you used a CDP. There are no lack of tools to create a real single customer view in 2019. Although the concept has been around for a few years, in practice it’s only now being democratized. Here is a summary of the primary approaches, to bring you into 2019. Need support in this process? Our team of experts in marketing automation and data science will be happy to answer your questions! Louis-Philippe brings both an innovative vision and a rigorous strategic judgment to the table when it comes to omnichannel strategy. Leaning on good data, as well as a leadership rooted in realistic and measurable objectives, he embodies the business culture at Adviso.